Stretch marks? : They have arrived. Not many but I’m sure it’s just the beginning. Oh well. I don’t really care. Best moment this week: J’s birthday. It was a great day all around. Miss Anything? : Having an alcoholic slushie drink at the restaurant for J’s birthday. Movement: This one is crazy! 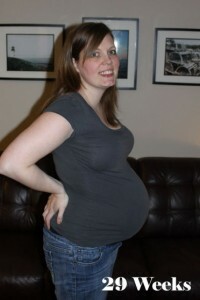 I think it’s transverse since taking my belly picture on the 2nd. Belly Button in or out? : Pretty flat. Looking forward to: Leafs game with Dad, J, E on Valentines’ Day!